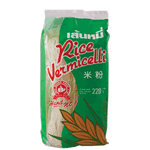 Rice vermicelli are thin noodles made from rice and are a form of rice noodles. They are sometimes referred to as rice noodles or rice sticks, but they should not be confused with cellophane noodles, which is an Asian type of vermicelli not made from rice. Product of Thailand.